COLUMBIA – The numbers of sexual assault and harassment cases in the U.S. military are staggering. Loyola University Maryland’s department of pastoral counseling and spiritual care is helping bring change to some branches now. 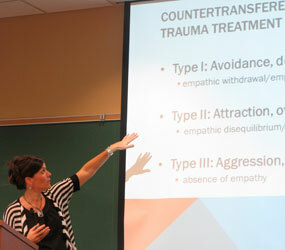 Loyola’s Columbia campus hosted a sexual assault and prevention training program Sept. 19-23 for chaplains of the U.S. Air National Guard. The chaplains take part in a program called SAPR (Sexual Abuse Prevention Response) and are often tasked with counseling military servicemen and women who have been victims of sexual assault. Stephanie Van Deusen, an affiliate faculty member at Loyola who helped develop the training and presentations, said “30 to 40 percent” of active military soldiers are assaulted by other soldiers during service, with “up to 80 or 90 percent” of soldiers being sexually harassed. Van Deusen said the problem can’t be ignored. He said the Department of Defense has put an increased emphasis on caring for its servicemen and providing safe environments. Military organizations tend to be viewed historically as masculine and patriarchal. Van Deusen said the program was a major step forward that could lead to widespread change. Sharon Cheston, professor and chair of Loyola’s pastoral care department, said the school was chosen for the program during the last year because of its unique ability to address the pastoral dimension. She hopes all of the National Guard chaplains across the country will take part in the training. “What our department brings is what happens to our faith, our belief in God, and how we reconcile true horror with a loving God,” Cheston said. Van Deusen said the course aimed to broaden minds as well. “We wanted to help these folks see trauma through the eyes of a sexual assault victim and to understand the impact of that on them and give them some skills to manage the pastoral needs once somebody is sexually assaulted,” Van Deusen said. Two attendees confessed to being sexually assaulted in their lives. One man said he was forced into an incident 35 years ago that he repressed. Hearing the man’s testimony, another woman said she had been molested in her personal life. Giles said he has often been the first person told by men and women that they were assaulted during their lifetime. Major Trisa Kelly, an assistant pastor with the Church of God in Portland, Ore., said she could pastor to victims and perpetrators after the course. Major John McDonough, a Catholic chaplain in Charleston, W.Va, said the training was overwhelming in its breadth. “It’s a lot of information,” McDonough said. Van Deusen and Cheston both said they were honored by the opportunity to serve the U.S. military with the courses.